When studying D.R. Anthony, there are times when his life takes on a Forrest Gump-like quality, particularly within the abolitionist movement where he frequently appears as an ancillary, yet interesting character. Undoubtedly this phenomenon is true of many historical figures, especially if you study one individual long enough. Nonetheless, as someone who is still learning the trade of writing what amounts to a biography, its been a fascinating phenomenon for me to observe. I have already documented the close relationship between the Anthony’s and Frederick Douglass in earlier posts on this site, and I have hinted at the connections between the Anthony brothers and John Brown and his sons. Keep reading for more on these, and other connections Anthony had to the abolitionist movement. John Brown conducted his raid on the Harper’s Ferry armory on the night of October 16-17, 1859. He failed in his mission to capture the weapons stored there, but in his eventual execution succeeded in becoming a martyr. The song “John Brown’s Body” became an anthem among Union units, and Company K of the 7th Kansas Cavalry included one of Brown’s sons, John Jr, as well as George Hoyt, who was his defense attorney. Indeed, it might be argued that he accomplished just as much to end slavery in death as he would likely have accomplished had his raid succeeded. However, almost from the moment of his arrest, plans were afoot to prevent his execution entirely. D.R. Anthony worked with R.J. Hinton, Hoyt, James Montgomery and a number of other prominent members of the abolitionist movement on an audacious plan to break Brown out of jail. According to Oswald Garrison Villard’s 1910 biography of Brown, Anthony contributed $300 to the effort. Another anecdote following the Harper’s ferry raid involved Frederick Douglass. According to a 1920 article in the Topeka Capital, Douglass became a marked man after Brown’s raid, despite his opposition to it. The article claims that the Governor of Virginia put a warrant for Douglass’ arrest, causing the latter to flee to Canada. During this time, Daniel Read and Susan B. Anthony are said to have sheltered Douglass’ children while their father was out of the country. As it is told by Fred Douglass’ son himself, “but for the Anthony’s – Col D.R. and Susan B, I and the rest of my father’s family would have starved.” The veracity of this story is difficult to determine, as research has revealed no conclusive proof that D.R. Anthony traveled east at that time, though he did have plans to do so some time in 1859. He was definitely in Leavenworth as late as October, but a gap in his letters home, and the tone of his next letter to his sister suggest a prolonged absence during the fall of 1859. At a time when the movement was on very thin ice thanks to Brown’s actions. No good Historian gets far without asking and answering questions about why their subject is worth pursuing, and what its significance is. What this site tries to do is to use facts (in this case D.R. Anthony’s life) to explore major events and themes of the past, all in the quest to better understand both that past, and our present. These small anecdotes from Anthony’s life demonstrate how closely knit the abolitionist movement was, an attribute undoubtedly born out of necessity which also contributed to their success. I’ll end by saying that, for any students reading this who are fed up with learning history as an endless series of dates, names, and places, know that those facts by themselves are not history. If it helps, think of them as a means to an end; a means by which to explore greater themes. One of the chief characters who frequently appears alongside Daniel R. Anthony is Charles Rainsford Jennison. He and Anthony served alongside one another during the Civil War, but their relationship was often strained, and they eventually became rivals as the different factions of the old free state majority fought for control of Kansas. During their time in the army, Jennison was the “spiritual” leader of the Seventh Kansas Cavalry; officially the commanding officer, he helped provide its abolitionist animus and set the tone for its early activities. However, he was an absent commander, allegedly spending much of the first 8 months of the war away from the fighting, passing his time at poker. 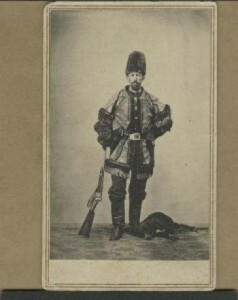 Anthony was present with the regiment until his arrest in June of 1862, and was its day to day leader, occasionally receiving Jennison’s instructions from afar. Anthony chafed under Jennison’s leadership and took a dim view of his qualifications. 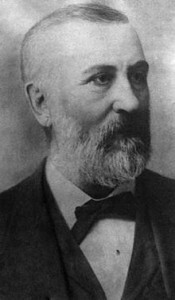 In a February letter to his brother-in-law, he wrote “Jennison has done everything I have asked of him…but he is in reality unfit for any position on account of his poor education…the prestige he has is his name – which is worth a great deal.” Simeon Fox would later relate a story to William Connelly, secretary of the Kansas Historical Society, in which Anthony had a soldier confined under guard for breaking regulations about caring for the horses. When the soldier in question was freed by his comrades, it precipiated a showdown between Anthony and the men under his command. Guns were drawn, and, as Fox tells it, only Jennison’s timely arrival prevented violence. One of the side effects of the Seventh’s command arrangement was substantial confusion as to who exactly to blame for the Seventh’s wanton destruction and aggressive policy of slave emancipation. Secretary of War Edwin Stanton named Jennison as the leader of the unit in a letter to Missouri politicians who were complaining about the treatment of pro-Union civilians. Union General Henry Halleck credited Anthony with most of these same outrages. Later generations have not been immune to this either. In Cass County and neighboring areas of Missouri, the lone chimneys that remained after house’s belonging to secessionists were burned (giving rise to the area’s moniker ” the burnt district”) were known as “Jennison Tombstones.” Certainly both deserve the fame, or infamy, due them for their prosecution of the war in Missouri. Jennison was arrested by military authorities in February, 1862 on the not uncommon charge of using inflammatory language towards President Lincoln and other Union officials, and for suggesting that the regiment would disband if he (Jennison) were to resign. According to historian Stephen Starr, Anthony and his fellow officers played a role in Jennison’s arrest. It is no secret that Anthony greatly coveted command of the 7th Kansas Cavalry, which he received as a result of Jennison’s absence and Anthony left the regiment in September of that year, never to return. Both returned to Leavenworth, where Anthony made his first serious foray into politics, becoming Mayor of Leavenworth in April, 1863. Jennison eventually found his way back into a military capacity, first as a leader among a group of pro-Union vigilantes known as a “Red Legs,” and later as commander of a new regiment, the 15th Kanas Cavalry. As Mayor, just as in the Army, Anthony ruled with a firm hand. When Anthony resisted Union General Thomas Ewing Jr’s declaration of martial law in Leavenworth, Jennison and George Hoyt, a former Captain of the 7th who worked with Anthony to free slaves, let him know exactly how they felt about their former fellow officer: “let it be remembered that while we were friendly to the nomination of the mayor…we did not subscribe to any express or tacit endorsal [sic] of those gross and tyranical [sic] userpations [sic] of authority which have all along marked his official career in this city.” Both would oppose Anthony when the latter ran for reelection the following April. Voting in that election was marred by riots during which Anthony and his supporters were intimidated, and the incumbent mayor himself physically accosted. Albert L. Lee took over the 7th Cavalry after Anthony resigned. He went on to become a Brigadier General, and commanded Cavalry during the siege of Vicksburg. The point illustrated in this relationship is that the majority which brought Kansas into theUnion as a free state, and which was so unified by its common enemy – slavery – suffered from quite a lot of infighting. Once status as a free state was secured, Kansas Republicans (and the vanishingly few Democrats who remained) divided bitterly over several issues. Rivalries between major political players (Jim Lane and Charles Robinson), civilian and military authorities (D.R. Anthony and General Thomas Ewing Jr) and within the military itself (General Ewing and General Blunt, or Anthony and Jennison) all created rifts within the state. The White Cloud Chief recognized the damage done by these rifts when it recommended Albert L. Lee for Congress. Lee was a former Major under Anthony in the 7th Kansas who superseded Anthony after the latter’s arrest. Anthony, true to form, deeply resented Lee as well, but because all of the scandals and infighting had “all passed over without dragging him [Lee] in,” the Chief thought he would make an excellent candidate. During the time between his first trip to Kansas in 1854 and his subsequent permanent move their in 1857, Anthony continued working to ensure Kansas’ entrance to the Union as a free state. He worked closely with the New York State Kansas Committee, (NYKC) an organization similar in purpose and loosely affiliated with the New England Emigrant Aid Company. Some of the best documents related to the NYKC are held in the William Barnes collection at the Kansas State Archives in Topeka, KS. Barnes was the secretary for the Committee, and managed one of its most important tasks; providing tickets to people who wished to emigrate to Kansas. According to Barnes’ log books, and his own letters, Anthony served as a point man of sorts for the Rochester and Buffalo areas of New York. In some cases, he may have fronted the funds himself, with the understanding that the would-be emigrant would repay him. Pictured below are two tickets furnished by the NYSKC . One is for an individual named “Mills” from Rochester, the other for Jacob M. Anthony, Daniel R. Anthony’s younger brother, and the youngest of the Anthony children. For many individuals, going to Kansas was simply a means to achieve a fresh start. For others, it was a way to fight against slavery. Like much of that great moving target known as the “frontier,” it attracted men and women from different levels of society, all of whom were looking for something, were willing to fight for their future, and expected take an active role in shaping the state they lived in. This is a huge part of why the doctrine of popular sovereignty proved so critical to Kansas; it (theoretically) placed a great deal of power directly in the hands of the people, which was what they expected in the first place. It was the moment when Missourians appeared to try and deny this right to participation in government – which had been so explicitly promised in the Kansas-Nebraska Act – that Kansas elbowed its way into the avant-garde of the crusade for greater equality. The above documents are another instance where D.R. Anthony’s story weaves in and out of the larger narrative of Kansas’ quest for statehood. Organizations like the NEEAC, or the NYSKS were not unlike modern volunteer organizations; they were minutely organized, down to county and town chapters in the case of New York. Without the efforts of people like Daniel R. Anthony or William Barnes who organized and sustained these organizations, or the courage of the men and women who received tickets, the Kansas story could have been very different indeed. Etcheson, Nicole. Bleeding Kansas : Contested Liberty in the Civil War Era. Lawrence: University Press of Kansas, 2004. Nicole Etcheson’s book is a superb and relatively recent treatment of the subject of Bleeding Kansas. Here are two others from past decades. Rawley, James A. Race an Politics: “Bleeding Kansas” and the Coming of the Civil War. Philadelphia/New York: J.B. Lippincott Company, 1969. Watts, Dale. “How Bloody was Bleeding Kansas? Political Killings in Kansas Territory, 1854–1861.” Kansas History 18, no. 2 (1995): 116–129. In the 1888 race for the Republican nomination for Governor of Kansas, Anthony’s chief opponents included veteran Kansas politicians A.W. Smith, Lyman U. Humphrey, and George T. Anthony. The last of these was Daniel Anthony’s own cousin, and himself ex-Governor. They may have been family, but there was no love lost between the two. Anthony made some efforts at campaigning, mainly through the influence of his friends such as Morrill and Beck, as well as Kansas Senator John Ingalls. 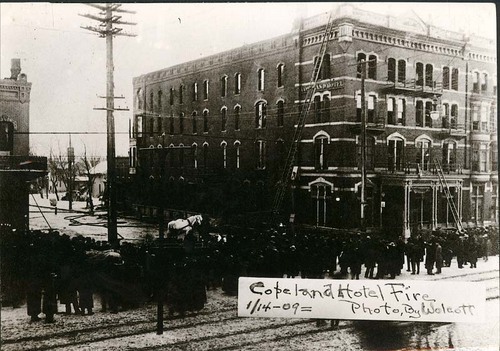 He also paid visits to newspapers, such as the Kansas City (Kansas) Gazette, and delivered speeches at events like that held in Junction City on May 2nd. By the end of May, Anthony appeared to be in third place, based on those delegates whose choices had already been announced. Surname-based confusion aside, the primary storyline of the rest of the convention was the dominance of Lyman Humphrey. The first ballot was the closest, with Humphrey outpacing Smith by about thirty votes. Anthony collected 27 votes, placing 7th. He was 6th in the second ballot, before falling several places in the third and final ballot, in which Humphrey finally swept away the competition. Despite the fact that he was never a contender, Anthony must have taken some satisfaction in faring better than his cousin, who never received more than 2 votes from the delegates. Anthony, for his part, insisted publicly that he was not going to campaign hard, but that if the people of Kansas wanted him, he would gladly accept the nomination. Privately however, this race may have meant quite a bit more to him than he let on. “My nomination must come now or never” he wrote to his friend and editor of the Holton Recorder, Moses M. Beck, “63 years…in this world and if I ever had a chance it is now” In his letters to Beck he expressed optimism that he could achieve his goal; “my county will give a solid delegation for me…promises of support all over the state have come, enough to give me a respectable support, and give me a chance after the first two or three ballots.” (Letter to M.M. Beck, March 22, 1888) By April, Anthony had reason for optimism; on April 20th, he wrote to Beck “of thirty five (delegates) already chosen, more than half of them are for me.” Furthermore, he had received support from some of the leading politicians in Kansas, including Congressman Edmund Morrill (left), who represented Kansas’ 1st District in Washington. In studying D.R. Anthony, one of the traits that stands out about him is his ambition, and his willingness to gamble on himself. For better or worse, he never did anything halfway, which makes his public insistence that he would not actively seek the Governorship all the more odd. By 1888 he was known across the state for his combativeness, and his quiet entrance into the race was likely a tactical move to keep from ruffling too many feathers. Anthony wanted to be governor of Kansas very badly, an achievement that would put the exclamation point on his life. With the convention set for July 25th, in Topeka, he would soon have his chance. The Leavenworth Times was introduced on March 7th, 1857, available for area citizens at $2 per year. In its very first issue, editor Robert Crozier (a future Senator from Kansas) declared his paper opposed to “all measures and efforts to procure the admission of Kansas to the Union as a slave state.” It is fitting that the Times would be purchased in 1871 by Daniel Read Anthony, one of Kansas’ strongest free state advocates. Anthony, then 47, had worked at other newspapers. His first, the Leavenworth Conservative, was a joint effort with his friend D.W. Wilder. With Anthony as publisher and Wilder as Editor, the Conservative earned a reputation for radical abolitionist Republican views. 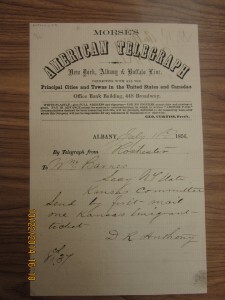 Anthony also bought the Leavenworth Bulletin in 1864, but it was his purchase of the Times that made him the leading newsman in Leavenworth. The Slavery question had been answered, but under his guidance, the Times fought for other radical causes, including his sister’s Womens Suffrage movement. Reproduced below is a list of rules Anthony set out for his employees. They offer insight into the workings of a typical frontier newspaper and Anthony’s style of leadership and discipline. When Anthony bought the Times, newspapers were crafted by painstakingly setting metal letters (known as type) into composing sticks to form words, sentences, and paragraphs. The entire paper was built by a team of workers known as “compositors.” The resulting “bed” of type would then be put in the press, inked, and have paper applied to it. 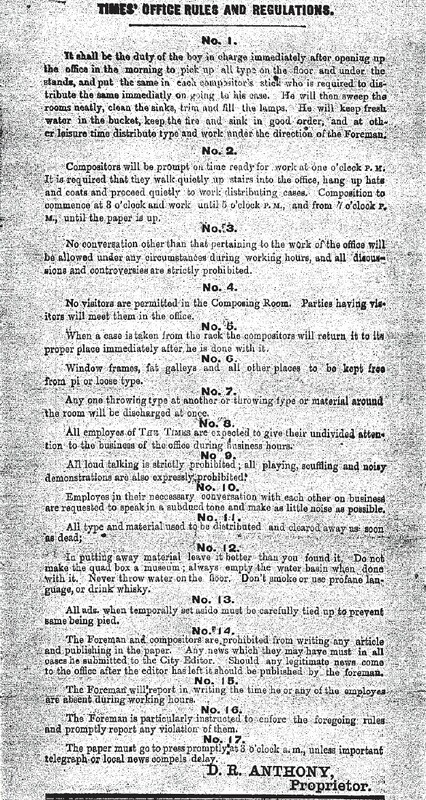 Looking at Rule # 2, we can see a newspaper compositor’s workday was not a 9:00 – 5 affair. Anthony’s final rule stipulated that the paper “go to press” at 3:00 AM. Operating a successful newspaper on the American frontier was a complex job; dozens of man hours were required to print a single issue, and it took an attentive leader like Anthony to make things run smoothly. That said, the news was a growth industry because people craved information. According to the Library of Congress, in 1870 Leavenworth citizens enjoyed over a dozen newspapers, many with separate weekly, daily, or evening editions. It was the Frontier version of the 24-hour news cycle. Of those, only the Times remains, due in large part to the leadership of Daniel Read Anthony and his heirs, who maintained control of the paper into the 1960s. The included newspaper image is from page 2 of the August 11, 1863 issue of the Cleveland Morning Leader. The article is a reprint from Anthony’s paper, the Leavenworth Conservative. Why the Cleveland paper picked up this particular story is anybody’s guess, but it does illustrate the fact that other northern states were not oblivious to events in Kansas, and Anthony’s behavior in particular. 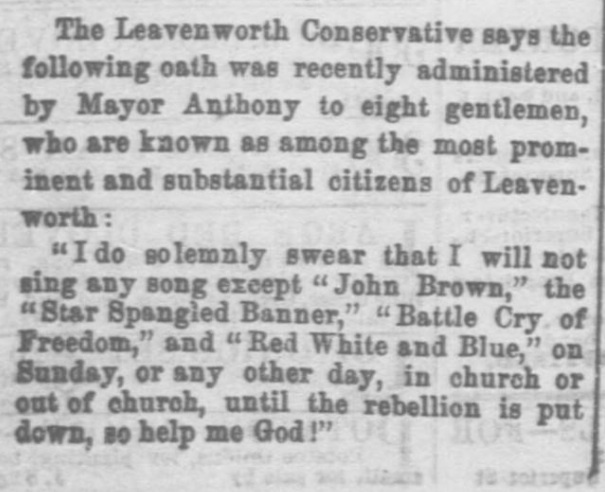 The article describes Anthony administering an oath to 8 prominent Leavenworth citizens. Click the link below for the full text from the two letters that Thomas Ewing and Daniel Anthony exchanged following Ewing’s declaration of martial law. In these two letters, Ewing and Anthony each lay out their arguments for and against martial law. Each describes the sequence of events leading up to Ewing’s declaration, although their accounts differ from each other. One noteworthy passage from Anthony’s letter describes how he and Ewing had come to an arrangement whereby action by the military would be avoided. Anthony writes with palpable anger, asking Ewing to revoke his order and citing previous legal cases from other states, including Massachusetts. He also points to previous orders given by Ewings superiors that explicitly state that martial law is not to interfere with the application of civilian systems of justice. As a soldier, Anthony had little regard for official Union policy (or lack thereof) for dealing with slaves, and he took it upon himself to free them. Now as a civilian mayor, he showed his true colors once again, resisting the notion that the Union army should be preventing the people of Kansas from working to free slaves or to seek revenge against secessionist Missourians. Sources: The text of these letters is from The Miscellanious Documents of the House of Representatives, 1888-1889, volume 3. This book is fully digitized and is available for free on Google Books as part of their Public Domain digitization program. The letters begin on page 389. On June 26, 1863, General Thomas Ewing Jr. made a speech in Olathe, Kansas, where he reiterated his resolve to stop the raids into western Missouri that were being conducted by Kansas irregulars, such as the notorious Red Legs. “I mean…to stop with a rough hand all forays for plunder from Kansas into Missouri…there are very many men in Kansas who are stealing themselves rich in the name of liberty.” Among the “many men” whom Ewing swore to stop was Daniel Anthony. Anthony was a friend to the Red Legs and an ally of Kansas Senator Jim Lane, who helped to organize and promote punitive expeditions by irregulars into Missouri. Just days after coming into office, Anthony had written to Ewing’s predecessor, General James Blunt “The city of Leavenworth is now quiet…I am confident that, with the police force I have, the lives, persons, and property of loyal citizens will be fully protected.” However, he was still the same radical abolitionist who believed those who supported the confederacy deserved no protections. He ran for mayor, and won, on those beliefs. Anthony had no problem dealing with General Blunt, who owed his position to Jim Lane. Ewing was a different matter. 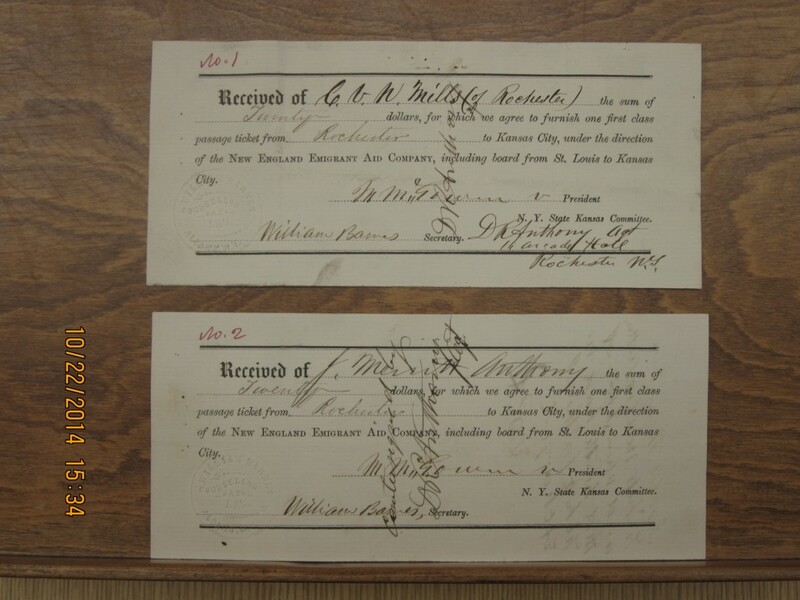 Ewing began sending detectives into Leavenworth to find and return property taken from Missourians by raiders from Kansas, which would have included escaped slaves. On July 17th, one of Ewing’s detectives tried to take some horses from an escaped slave named “Reed,” detaining him as a thief. Anthony in turn had the detective arrested, charging him with “breach of the peace” and returning the horses to Reed. A second of Ewing’s detectives was arrested on the 18th, under a similar charge, after the officer tried to repossess a horse apparently owned by the U.S. government (likely identified by a brand or other mark). The detective was fined $50. During the hearing, Anthony himself served as counsel to the plaintiff claiming ownership of the government’s horse. Ewing, who already thought Anthony to be a radical and an impediment to his military goals, responded by declaring martial law in Leavenworth County on July 19th. In a July 20th letter to the Mayor, Ewing accused him of trying “to interrupt the execution of my orders.” He called the administration of law in Leavenworth “inefficient” and argued that martial law was necessary because Anthony lacked the jurisdiction to punish Kansan’s for offenses committed in Missouri. Anthony responded, writing to Ewing on July 22nd. Why declare martial law in Leavenworth, Anthony asked, while in “Atchison County a vigilance committee has to enforce the law” and “in Johnson County…loyal citizens are being murdered almost every week by bushwackers from Missouri?” Why did Ewing’s detectives care more about “swindling poor runaway slaves out of their horses” than rooting out southern sympathizers? One reason the Civil War is still so instructive is that it put new stresses on our system of government, stresses which influence us to this day. Fears about big government and about rogue state or local governments have always colored our society. As you read the next few posts about Daniel Anthony and the stirring events in Leavenworth during the summer of 1863, ask yourself, whose side would you choose? Was Daniel Anthony right to defend an escaped slave’s ability to steal from his former master, or to protect Kansan’s who sought bloody vengeance upon Missourians for past depredations? Was Ewing right that the military alone could properly prosecute civilians who engaged in their own war, and as such trial by jury should be suspended? I’ll give you a hint, it’s not one or the other, which is part of why it’s important. “Leavenworth is for the Union, for the Army, for Universal Freedom.” So crowed the Leavenworth Conservative on April 7th, 1863 after Daniel Anthony (the Conservative’s owner) was elected Mayor. The Conservative may have meant well, but in 1863 support for the Union and support for “Universal Freedom” were still mutually exclusive. That summer, Anthony would again find himself at odds with the official policy of the United States Government and the Union Army. This time, his opponent would be the local Union commander, Brigadier General Thomas Ewing Jr. The next few posts will document and analyze this struggle, in the broader context of both Anthony’s life, and the Civil War, but first, some background is necessary. The Civil War in the Kansas-Missouri border area was fought as much by guerilla forces and local militias as by the small numbers of Union and Confederate “regulars” that were present. Here, the two sides had already been fighting for nearly a decade, and this bad blood fueled a special kind of savagery unique to the Kansas-Missouri region. Like Anthony, Thomas Ewing Jr. came to Kansas when it was still a territory. Like Anthony, he worked hard to make Kansas a free state, and he would serve as the State’s first Chief Justice, before joining the Union Army. As spring returned to Kansas, and Daniel Anthony began his term as Mayor of Leavenworth, guerilla commander William Clarke Quantrill was preparing a renewal of “his type of warfare.” His was a bloody style that involved harassing Union troop movements, sacking pro-Union towns, destroying infrastructure such as railroads, bridges and telegraph lines, and killing anyone who got in his way. (Brownlee, Gray Ghosts of the Confederacy, 112-113) To counter the guerillas and to protect Kansas from invasion by Confederate regulars, Kansans organized guerilla groups and militias of their own. The most infamous of these were known as the “Red Legs.” Seasoned readers of this blog may remember Charles Jennison. He was among the leaders of these irregulars, and he was joined by many of men whom he and Anthony had commanded in the 7th Cavalry. These veteran Jayhawkers conducted raids against suspected southern sympathizers and brought goods, loot, livestock, and slaves across the border into Kansas. Pro-slavery Missourians, as well as “Copperhead” Kansans were murdered, lynched, beaten, or otherwise deterred from interfering. Contemporary newspaper articles indicate that the first stop for stolen goods or liberated slaves was often Leavenworth, conveniently located on the Missouri River’s west bank. In June of 1863, the Union commander of the Department of the Missouri, Major General John M. Schofield, created the District of the Border for the purpose of gaining greater control over the region. Ewing, then a newly minted Brigadier General was placed in command. (Smith, Thomas Ewing Jr, 189) Ewing’s new district comprised sections of Kansas and western Missouri that lay “north of the thirty-eighth parallel and south of the Missouri River” (Brownlee, Gray Ghosts, 113-114). This included the important Kansas towns of Leavenworth and Lawrence, as well as Kansas City, Missouri. Ewing made his headquarters in the latter. In order to deny shelter and comfort to confederate guerillas operating along the Missouri side of the border, Ewing recognized that he had to win back the hearts and minds of loyal Missourians. He would have to prove that the Federal Government could protect them from the Red Legs and other “thieves,” as Ewing called them, who had thus far been able to wage their own, unofficial war. To these ends, Ewing first sought to shut down the black market for stolen Missourian goods that had cropped up in Leavenworth. This was no small task, and for it to succeed, Ewing would need the help of Daniel Anthony. Brownlee, Richard S. Gray Ghosts of the Confederacy: Guerilla Warfare in the West, 1861-1865. Baton Rouge: Louisiana State University Press, 1984. 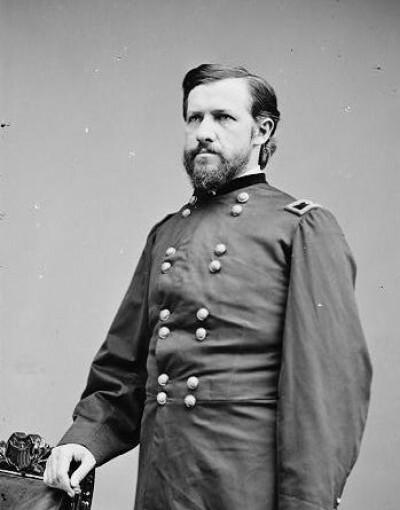 Smith, Ronald D. Thomas Ewing Jr. : Frontier Lawyer and Civil War General. Columbia: University of Missouri Press, 2008. Daniel Anthony of Kansas by Taylor Bye is licensed under a Creative Commons Attribution-NonCommercial-NoDerivs 3.0 United States License.